Omg I luvvvvv JAG the smart arse ! Great book he is soo funny and a wise arse but you gotta love him ! The things he comes up with and out with what a crack up! And I love the shirt sayings! Gotta read this book there's gotta be more books with him in it ! 4.0 out of 5 starsJag-tastic!! I loved reading this book. After reading Cruz I couldn't wait to read this. Jag is like a fiery ball of alpha hotness. Sunni is so sweet and loyal. The drama and romance in this book was so darn good I just gobbled up the pages. I absolutely freaking love Jag in the previous book and love him even more in this one, he was adorably annoying and freaking hilarious and Sunni she was such a doll. 4.0 out of 5 starsA great steamy, suspenseful and fun addition to the series! 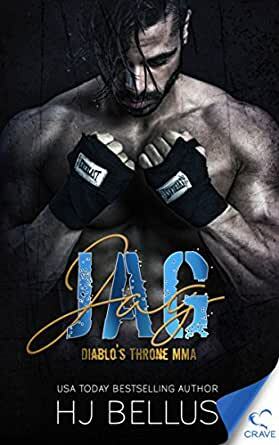 Jag was HJ Bellus’ second book in the Diablo’s Throne series. Diablo’s Throne was an MMA training gym. We met Jag in book one, Cruz, and he was the gorgeous, funny and care free pseudo sibling to Layla. In Jag we find it was all a facade to hide the pain of his past; however, as the story progressed and he battled his demons, it was no longer a facade, but the real Jag and I loved everything about him. His random jokes to Sunni were awesome. And don’t get me started on his relationship with Bella (Cruz and Layla’s toddler daughter) - they were both precious and hilarious together. I was also a fan of Sunni’s. It was obvious she was hiding something big and although we knew it involved running from an ex, it wasn’t the same sad storyline. There was a level of suspense to it that kept me hooked from beginning to end. Bellus took us through the relationship development while uncovering individual aspects of both Jag and Sunni. Bellus also added some MMA drama that was a partial carryover from the previous book. And lastly Bellus continued to focus on the camp from Diablo’s Throne - giving us more from Cruz/Layla while developing further interest in others that we’ll see more as the series progresses. In the end, I couldn’t put it down. It was well written (other than some editing errors), well developed and kept me captivated and laughing all at the same time. Trick is up next and I can’t wait to see where Bellus takes us now. Sonni and Jag we quit the read. I never doubt you writing Heidi. It’s just simply amazing this new series is awesome. Jag has a lot going on and Sonni needs to open up. Does she in time? What is she afraid of? Who or What is she running from? One click and find out. What can I say about Jag and Sunni?? They are the perfect couple!! Their story isn’t soft and sweet but true and honest!! I can’t wait to hear from the rest of the team!!!! This author has done it again with book #2. I definitely love a good MMA with a love story behind it.